Word to the wise. Toddlers can be pretty resilient when it comes to not eating something they don’t like or think they won’t like. So pick your battles wisely. One thing is for sure, toddlers need fiber. In this article I’ll help you avoid the battle of ‘the turned up nose’ and share a list of 7 high fiber foods for toddlers that are a big hit in my house. Why Fiber ﻿A﻿nd How Much? Why Fiber And How Much? 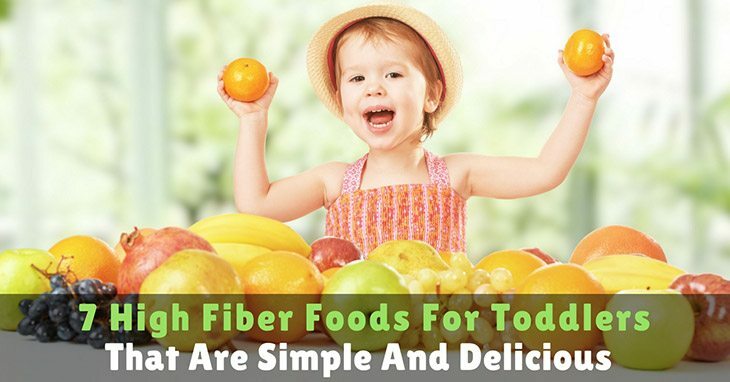 Fiber is good for keeping your Little One full without the extra calories and urges to overeat. Which means packing high fiber snacks for your kiddo can keep those little hands out of the cookie jar. Fiber also helps in digestion by helping foods pass through the body so that they don't get constipated. How much fiber should your toddler be getting on a daily basis? According to WebMD, toddlers 1-3 years need about 19 grams of fiber per day and 4-8 year olds need about 25 grams per day. Foods with 3-5 grams per serving are considered high fiber foods. Next time you are out grocery shopping make sure to read the labels. You’ll find fiber listed under carbohydrates. Foods with at least 3 grams per serving are considered good sources of fiber while foods with at least 5 grams are considered excellent. Here’s the not-so-tricky part. Most high fiber foods for toddlers are actually on the ‘good list’ of foods that they’ll eat. At least for my toddler they are. Here I’ll list the foods that I found easy and ‘acceptable’ along with some yummy recipes to help you get fiber rich foods out of the ‘no fly zone’ for your toddler. 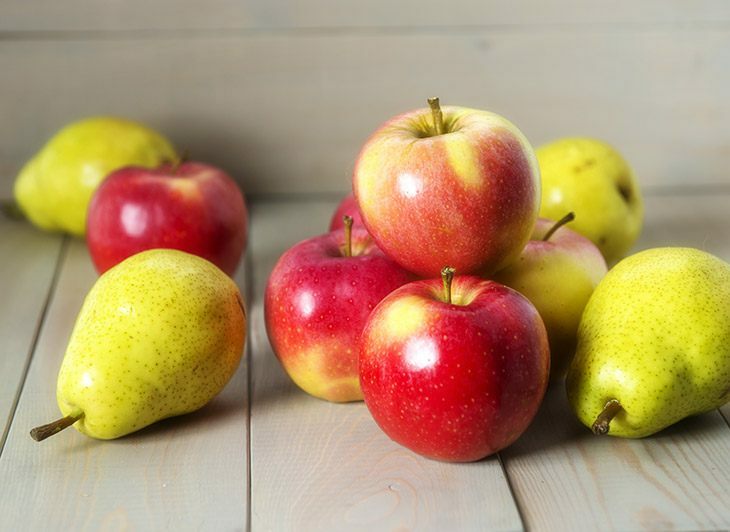 One apple contains about 4 grams of fiber and one pear has 6 grams of fiber. Both can be made into quick and easy snacks for your Little One. Leaving the peel on is recommended which means you’ll want to buy them organic. Apples and pears are apart of the ‘Dirty Dozen’ when it comes to pesticide contamination according to EatingWell.com. Apple and pear slices go great with peanut butter. Baked apples with steel cut oatmeal - This recipe calls for 1 cup of steel cut oatmeal. However, ¼ cup of steel cut oatmeal equals 5 grams of fiber so I cut the recipe down. Apples and pears make great toppings for pancakes and yogurt. Apple pear snack cake - This will feel like a treat for your kiddo because they can have cake for a snack. High fiber cereal can be a little tougher depending on the type of cereal you serve. My toddler wasn’t a fan of plain bran cereal, which I’m not quite sure one really is. So you’ll want to get a cereal that has berries/fruit mixed in or sugar and cinnamon. 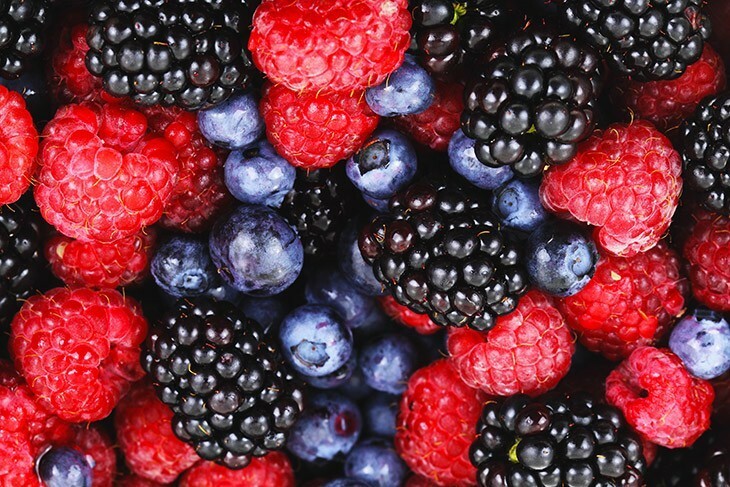 Berries are a great source of fiber and happens to be an easy go-to for toddlers. One perk about berries is that you can eat them year round because they’re easy to store in the freezer. I always have berries stocked in my fridge. An easy way to serve berries is in a fruit salad, which is one of our favorite go-to’s during the summer. Mixed berry crisp - This recipe tastes amazing and it has 4 of the higher fiber berries, win win! Berries make great toppings for pancakes, cereal, and even salads. Very berry muffins - These are super easy to make and my Little One loves them. Popcorn is such an easy snack, take a small baggie full for outings and playdates or have a bucket full for movie night. And what toddler doesn't like popcorn? 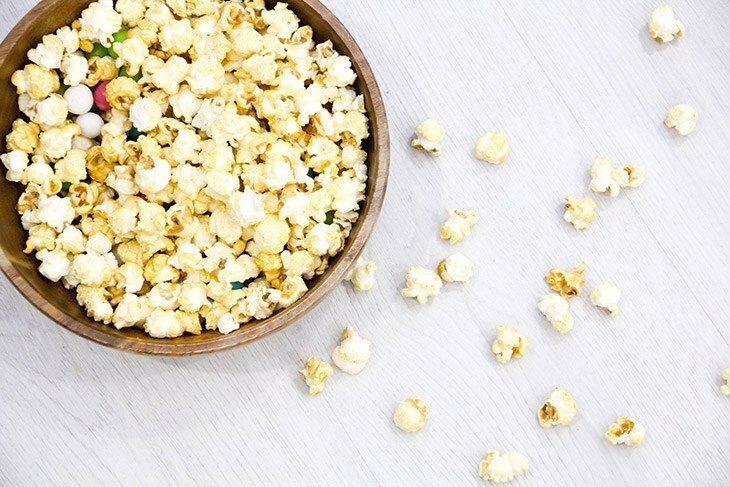 3 cups of air popped popcorn equals 3.5 grams of fiber. Add chocolate chips after it’s been heated up to make it a salty-sweet snack. Sugar crunch popcorn - This recipe is great for parties or sleepovers because you add food coloring to make the popcorn bright and fun. One potato contains about 5 grams of fiber. It’s recommended that you leave the skin on to get the most out of the nutrients. Potatoes are also apart of the Dirty Dozen, so I recommend you buy organic. Make a baked potato bar where you lay out different ingredients that your family likes to load on their potatoes and let everyone go down the line. This is especially fun for my toddler. Mini loaded baked potatoes are great for smaller portions as well as being able to offer different types of potatoes and toppings. 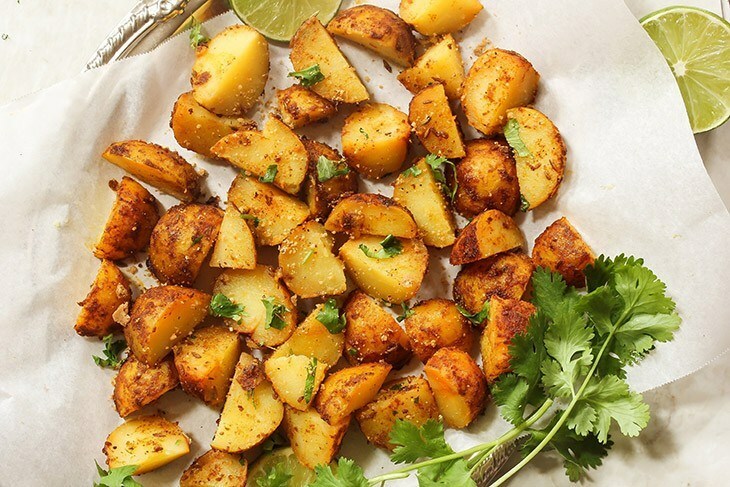 Crispy skin potatoes is a way to cook potatoes with their skin on and it not “taste like dirt” as my husband says. This is one of my favorite recipes to use. One slice of whole grain bread has 3 grams of fiber, one cup of cooked whole wheat spaghetti has just over 6 grams of fiber, an 8 inch whole wheat tortilla has 3 grams of fiber, and one whole wheat bagel contains about 4 grams of fiber. And there are so many things that can be done with these ingredients. I’ll start with the easy one. Sandwiches and toast on whole grain bread. You can even do a fried egg and bacon on whole wheat toast...yum. Whole wheat pasta with white sauce - You can’t go wrong with a savory white sauce. Toddler burrito - This is an awesome recipe! Whole wheat bagel pizzas - This is especially fun when my Little One gets to “decorate” her pizza. Beans are a rich source of fiber. However, they can cause gas and tummy discomfort so they should be introduced slowly to your toddler’s diet (especially if they’ve never had them before). 4 bean slow cooker chili - This is a fiber rich chili. I would monitor your toddler when serving this one just to ensure they don’t get excess gas or tummy aches. An easy way I get my Little One to eat beans is on a quesadilla. I mash the pinto beans or black beans and smear them on a tortilla with cheese and add mild salsa for dipping. White bean chocolate chip cookies - This is a recipe that I haven’t tried yet but have heard a lot of great reviews from other moms. While thinking about how my toddler was going to get enough fiber I could feel myself getting stressed. I have a picky eater. When I thought of fiber I thought of bran, and to me bran equals bland. How was I going to get her to eat foods that were bland? But as I started doing some research and looking at the nutritional facts on packages I realized it didn’t have to be difficult. I just had to keep making the foods she already liked. I even found fun recipes (which I shared above) to introduce new foods and it worked! Don’t think of high fiber foods for toddlers like I did, bland. Think of it as a chance for you to be creative and introduce your Little One to new foods that they’ll enjoy and give them the nourishment they need. I hope you find this list of 7 foods helpful in making sure your toddler gets the fiber they need. Leave me a comment below on which recipe worked best for you!